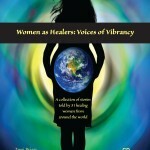 Women as Healers: Voices of Vibrancy is Tami Briggs’ newest book. 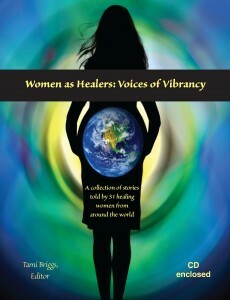 It is an inspirational, uplifting book featuring 31 gifted healers from around the world. They share their stories of empowerment, wisdom, and life learning; it is a “must read” if you are interested in the power and resiliency of the human spirit. These women, from all walks of life, are doing extraordinary things to help make our world a better place. They are authors, artists, consultants, nurses, educators, leaders and therapists. From Nebraska to the Netherlands, India to Iran, and Serbia to South Carolina (and many other U.S. states), they are pioneers – powerful, spiritual and spirited. As they reflect on and share their journeys of healing, they model taking risks, beating the odds, being of great service, making significant differences in the world, and living their passions. You will find these 31 vibrant women remarkable – both men and women have much to learn from them! They epitomize community and a strong support network, as they teach us about connecting – to our own hearts and to each other. They hold nothing back as they leave their beautiful legacies and exemplify this for you. They have found their “voices of vibrancy” and they invite you to do the same … it is time! A CD of Tami’s solo harp compositions is included so you can relax as you read the book. All Rights Reserved; Unauthorized Publication Prohibited by Law. For wholesale pricing, contact Tami Briggs. I was on the bus from San Francisco heading north to Sebastopol, California, to the third of four retreats for the Coaches Training Institute (CTI) Co-Active Leadership Program. I was intently reading the assignment sheet describing the requirement for our final project. Deep down, I knew that healing comes when we are clear about who we are and can give our gifts freely. In that space, I connected with my calling, my soul’s work, and life purpose: To be who I am and do what I love in the place I belong. I realized that part of my journey was to inspire others to do the same. During that third Leadership retreat, I created a vision for my final project – Project M.
“I lived the life that my mother lived and her mother lived. Men made all the decisions. We women counted for nothing. No one ever called me by name. I had been a daughter, a sister, a wife. This quote by a woman in India is a huge inspiration to me on how I want to live in my full power, including being involved in meaningful work where I make a difference. At one point in my childhood in the Netherlands, I lived at a Catholic boarding school led by nuns. My father was the mayor in my home village. As a child, outside my home and at the boarding school, I was the daughter of the mayor, not “Marlou.” I was rebellious and searched for ways to follow my destiny instead of following the rules and regulations. My mother has been an example and a model for me. When she was young, she could not attend high school; her father did not permit her to go because only boys were allowed to go to that school. She was meant to live her life as wife and mother. But that was not enough for her, so she studied at a later age. Eventually – married to my father and the mother of four children – she broke the social codes and accepted a job as a social worker. The boarding school I attended was for girls only. The school system made me feel insecure, and I was unaware of my own potential. It took me a long time to realize I was smart! What a journey this cancer experience has been! In total, I had 10 surgeries in 2 + years. During that time, I also experienced the loss of all my grandparents, my father’s heart attack and two strokes, and marriage counseling. Best of all, since my diagnosis, I have celebrated each daughter’s birthday six more times. I was cured of cancer when all of it was finally removed, but I continue to heal. I have lost several friends to cancer and have more friends with a new diagnosis of cancer. One in three people will be affected by some type of cancer. For this reason, I have been involved with Relay for Life (www.cancer.org). The Relay for Life celebrates those who have won the fight, remembers those who have lost the fight, and energizes us all to continue to fight back for our children’s future. The goal is that someday we will no longer have the word “cancer” in our vocabulary! I helped initiate a Relay in my small hometown/county in rural Kansas (Rush County, population 3,600). We hold the 12-hour event from 7 p.m. to 7 a.m. (this timing symbolizes the long night of the cancer journey). Teams “hold vigil” around-the-clock and around the track with 3,500 luminaries lighting the path in honor and in memory of those who have fought the fight against cancer. In 2008, Rush County was #10 in the United States in money raised per capita. In June 2009, we raised almost $69,000; this is $15,650 more than in 2008! This is an example of the wonderful support and great love I have felt from this community. While small in population, Rush County is mighty in the fight against cancer! The lives of Nancy and Arlene, though brief and troubled, became an inspiration for Carol to create a Healing Garden at the Bucks County Women’s Recovery Center. The center is a residential facility providing services and housing for women who are committed to turning away from drugs and alcohol. While Nancy and Arlene had been residents there, Carol had grown fond of them and was saddened to hear that each had succumbed to their disease of addiction after leaving the safe shelter of the center. Carol felt it was important to have a caring tribute present for the two women who struggled unsuccessfully to stay on the path of sobriety. She remembered that each had had a passion. One was an avid gardener and the other one had a walking practice. Carol decided that a labyrinth would be a perfect memorial to them, as well as providing a meditative and healing pathway for the center’s current residents. At our first meeting, Carol and the residents decided the pattern best suited to their purposes was that of the Heart-Shaped Healing Labyrinth. On a Saturday morning a few weeks later, we had a busy workday and completed a template of the labyrinth by attaching rope to the ground with roofing nails, a sort of acupuncture for the earth. Pride was evident in the faces of the residents whose hands-on involvement had cooperatively created the special sacred space. Collective awe was present as we ceremonially opened the labyrinth and were led in by the senior resident caring a candle. The newest resident entered last carrying a Twelve Step book and reading from it when all had gathered in the center. Tears flowed when one of us noted that we totaled 12 women standing there in the middle of the concentric hearts of the labyrinth. Those courageous women, each committed to healing her life, continued to work together during the next weeks to replace the rope lines with bricks and add plants, hand-made tiles, and sitting benches to their garden. They finished just in time for a public dedication. On a cool and breezy summer evening, over 40 people attended the event and walked the labyrinth. It was a tribute to its creators. When it was time to go, I was about to blow out the candle at the entrance in its crystal holder when I noticed there were two flames inside glowing side by side. 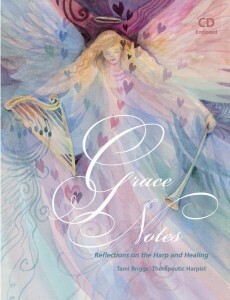 Grace Notes: Reflections on the Harp and Healing is a book about Tami Briggs’ most profound and deeply spiritual experiences playing the harp at the hospital and hospice bedside. Having facilitated and witnessed hundreds of harp therapy “treatments,” Tami’s anecdotal stories illustrate many dramatic accounts of using harp music as a complementary care modality. Explain the harp’s unique healing qualities. Discuss research on the effectiveness of music and its benefits. Show how music triggers memories and elicits emotional responses. Suggest musical applications to optimize your well-being. Describe how the harp can be used to create sacred space, facilitating a healing experience. Detail how the harp can bring intimacy, depth, and tenderness to the sacred experience of dying. 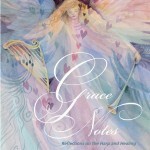 An enclosed CD highlights the music referred to throughout Grace Notes. Edelweiss (2:28) * Rodgers & Hammerstein/Williamson Music Co.
Threads of Love (7:12) * Time Line Productions, Inc.
* Copyright Permission Granted; All Rights Reserved; Unauthorized Publication Prohibited by Law. Melissa (from Chapter 5: Music and Emotions) — Melissa was 28 years old. She had brain cancer and the cancer had spread so much, the doctors could no longer operate. As I walked onto the surgical intensive care unit, her dad informed me the medical staff were going to withdraw her from the ventilator later that afternoon. I set up my instrument and began playing softly. Something beautiful was happening in the room. There was an incredible feeling of love — love coming from every person, spreading into every part of the room. Instinctively, those present knew to support and care and attend to each other and to Melissa at this most painful, yet beautiful, time. About 15 minutes later, Melissa’s husband came into the love-filled room. He was visibly touched by the beautiful feeling. He buried his face in Melissa’s pillow and almost crawled into bed with her as he, too, said good-bye. Through my own tears, I continued to play. Melissa looked relaxed, calm, peaceful, content. She was filled with love and radiated “all is well with me.” Everything (medicine, prayers, speaking and touching) that could be done had been done. Music was the final gift, perhaps touching her where nothing else could and giving her family comfort seeing her in such peace and love during her last minutes. The music softened the environment and helped create a sacred space where love, in its most beautiful earthly form, was present. Gladys (from Chapter 6: Spirituality) — Gladys had made a miraculous recovery and had progressed enough to be transferred from intensive care to a rehabilitation hospital. As I set up my harp, Gladys said, “I don’t deserve this, but nevertheless, I am going to thoroughly enjoy it!” I encouraged her to relax and just go into the music and allow it to take her wherever she needed to go. As soon as I started playing, Gladys laid down and shut her eyes. A gentle smile formed on her lips as she carefully removed her oxygen line. In her own way, she was making a statement: “I do not want to be encumbered while I have this experience.” A few minutes later, she lifted her hands and they began gently swaying in the air to the beat of the music. And the longer I played, the bigger her hand movements became, until her arms and hands were making huge, sweeping motions. It was as if her whole body was dancing through her arms and hands. The circle of connection was between the rhythm of the music and the beautiful movement of her arms and hands flowing through the air. I sensed she was on a different “plane,” taking a spiritual journey. Sarah (from Chapter 7: Death and Dying) – Sarah was dying of breast cancer. Two friends, a hospice nurse, and a cat joined Sarah for her farewell concert. Sarah was alert yet relaxed while I played. Sometimes the harp accesses people’s deep, deep emotions, as it would in this situation. Sarah’s two friends, who were emotionally close to Sarah, took this opportunity to tell her what she had meant to them. One of her friends said, “You have been such a fighter and you came so close to winning your battle, but it wasn’t meant to be. Now, I am struggling with the finality. I will miss you so much my dear, dear friend.” She enveloped Sarah in a hug and both were heaving with sobs. The music was taking them to their deepest wound of grief and sorrow; it was a time for one final connection. Music has been called the speech of angels.